Still getting to terms, how addicitive this thing called ‘Twitter’ can be! There are number of Twitter users who have 100s of followers and following 100s of other Twitter users. Here is cool a online tool to find out first and last Twitter user you followed. 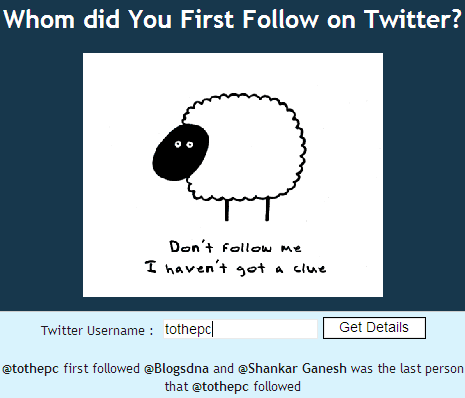 As for tothepc:- blogsDNA was first and Shankar Ganesh was last twitter user being followed as of now. Click here to check your first and last Twitter followed users, strictly for curious minds addicted to Twitter.